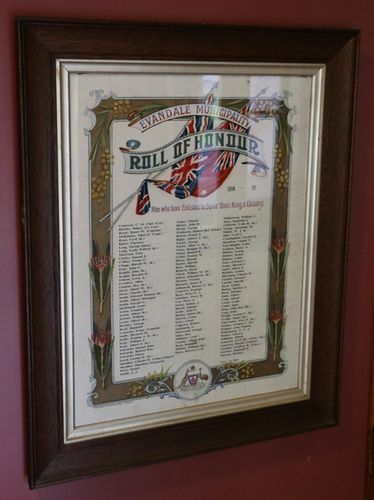 The Evandale Municipality Roll of Honour is a framed paper honour roll that commemorates those who served in World War One. It lists 125 names. The unveiling of the Honour Roll for the municipality of Evandale took place in the Council chambers, Evandale, on Friday night. The Warden (Mr. D. Viney) occupied the chair, and there was a huge attendance. After the singing of hymns the honour roll was unveiled by Mrs. St. Clair Cameron, of Fordon. It contained 124 names of those who had gone from the district to fight for King and country. Of these, 32 had made the supreme sacrifice. The Mercury (Hobart), 28th May 1918.